Global warming is the greatest challenge our species will face in the next 100 years,” says Justin Lewis-Weber. Currently a high school senior in California, Lewis-Weber has just published a paper in the journal New Space with what he thinks could be the solution to the upcoming energy crisis: putting self-replicating solar panels in space. These solar panels would to build copies of themselves, autonomously, on the surface of the moon. Then they would enter Earth’s orbit, collect the sun’s energy, and wirelessly beam it to the ground. Lewis-Weber’s paper builds on the work of John C. Mankins from Artemis Innovation Management Solutions. Self-replicating solar panels on the moon may sound like a crazy idea, but the notion of space-based solar power actually dates back several decades, gaining some steam during the 1970s oil crisis. It was set aside after oil prices went back down, but since then, two things have happened: One, the world has become a lot more desperate to solve climate change; and two, technological innovations have brought this crazy idea out of the realm of science fiction. The idea is gaining attention, and with some big investments, it’s possible that space-based solar power could become a reality within a few decades. Why Put Solar Panels In Space? The problem with regular solar power is that the sun isn’t always up. We have nights, and cloudy days. The panels also take up a lot of land. But if you were to put those same solar panels in space, high above the atmosphere, there would be no weather to contend with, and the panels would experience nearly constant sunlight. Plus, the light that reaches them would be 27 percent brighter, since it wouldn’t need to filter through the atmosphere. There’s no such thing as a cloudy day in orbit. These solar panels would use microwaves to beam power back to receivers on Earth. And in case you’re worried, those microwaves wouldn’t fry us. Nor would the large array cast a shadow over the Earth. Sunlight would diffuse around the structure, like it does for other satellites in orbit. Even when the moon eclipses the sun, it only casts a shadow over a small part of the world for a short period of time. The shadow from an array the size of Nevada would be “not even a millionth of that,” says Jaffe. There’s another advantage to space-based solar power. These arrays could beam power down across vast portions of the globe, wherever the receivers are set up. That opens up the possibility of sending electricity to villages in developing countries, or to disaster-stricken areas. The receiving equipment, Jaffe says, could fit into a couple of shipping containers. Plus, since the sunlight would be essentially continuous, space-based solar power doesn’t require the development of large batteries to store the power–something that holds back ground-based solar power. It’s going to take a LOT of solar panels to power the world, and launching all of those up into space will not be cheap. Just one SpaceX launch costs about $60 million–and that’s much cheaper than the competition. In the paper, Lewis-Weber calculates that it could cost tens of trillions of dollars to send up a meaningful number of solar power satellites. What if, instead of sending thousands of solar panels into orbit, we could just send up one that’s programmed to make copies of itself? And then each machine it makes would make copies of itself, and so on. Like multiplying rabbits, the population of solar panel satellites would grow exponentially, covering the size of Nevada in a few months or years. Earth orbit doesn’t have a whole lot of resources for building all those robots, so instead we could send the self-replicating machine to the moon, Lewis-Weber suggests. There, it could mine the soft lunar regolith for aluminum, iron, and silicon, to turn into parts for its solar satellite babies. Like multiplying rabbits, the population of solar panel satellites would grow exponentially. 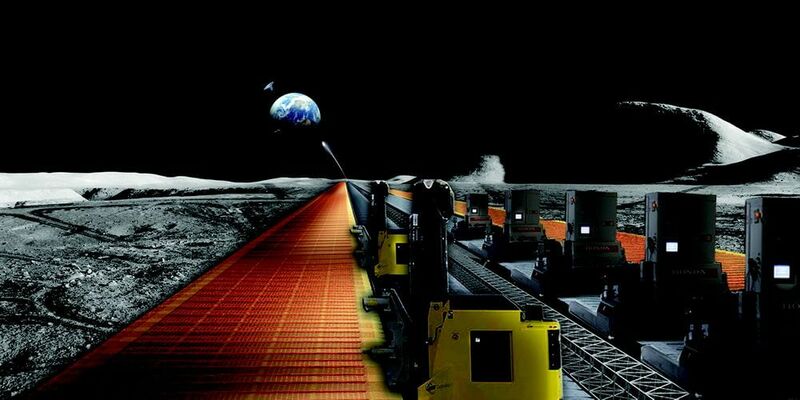 With about 18 different “species” of factory machine, each one performing a simple task, such as producing screws or solar cells, it is theoretically possible to turn the moon into a self-sufficient solar cell factory. Once the solar panels are ready, they could launch back to Earth–a process that’s a lot easer than launching from Earth, since the moon’s gravity is only about a sixth as strong as our planet’s–and take up residence in orbit. The process requires a lot of new technology, but none of it is particularly distant. There’s no need for warp drives or matter transporters (though the latter would certainly be useful). Lewis-Weber thinks he could make it happen for about $10 billion. Most of that would be spent on research and development. After the technology is developed and launched, each solar panel it makes is essentially free. For that same $10 billion, building and launching the solar panels from Earth would provide an array that’s large enough to power 150,000 homes. Not bad, but not as great as being able to power the entire world with the same amount of money. Solar panels in space could collect the sun’s energy without interference from the atmosphere, weather, or nighttime. Then they would wirelessly beam the power back to receivers on the ground. Even if Lewis-Weber’s R&D ends up costing $100 billion, the cost of the electricity it generates ($0.00042 per kilowatt-hour) would be several orders of magnitude lower than that of fossil fuels. Not only would that allow solar power to outcompete coal, oil, and natural gas, it means companies that invest in this technology could stand to earn a lot of money. Complex, self-replicating robots don’t exist yet, and “it’ll be a tough engineering challenge,” Lewis-Weber admits. But it seems possible. Scientists are making progress on building simple machines that can “reproduce”, and one 3D printer comes close to self-replicating; it can print 73 percent of a working copy of itself. In terms of digging up lunar dust and refining it into usable parts, that might be a job for Deep Space Industries and Planetary Resources, companies that are developing technologies to mine asteroids. It’ll be a tough engineering challenge. Meanwhile, researchers in Japan have successfully demonstrated the kind of wireless power transmission you’d need to get the energy from the solar panels in orbit down to the ground. They were able to beam 10 kilowatts of power to a receiver 1,640 (500 meters) away. The idea of space-based solar power seems to be gaining momentum. Out of 500 teams, Jaffe’s won 4 of the 7 awards at a recent Department of Defense competition. “With climate change, there’s definitely a renewed interest in this,” he says. In his presentation for the Department of Defense, Jaffe outlined a plan for getting space-based solar power off the ground. His strategy would use solar panels launched from Earth rather than the moon, but the step-by-step testing would likely be similar for both strategies. An international team would test the technology on the ground, before bringing it to the International Space Station. After that, they’d launch a “pathfinder mission”–a small-scale version of the array–into low Earth orbit. This mission would be able to beam power to anywhere in the world. We could get started for about the same amount of money that Americans spend on Halloween costumes for their pets every year. The electric car-making, rocket-launching billionaire would no doubt be a great fit for the project, if somewhat hard to get on the phone. But if you’re already taking moon shots, why not aim high?